So today I'm here to share a card that uses Neat & Tangled's On The Strip 2. It's an amazing background set and I keep going back to create more backgrounds and my own pattern paper with it. 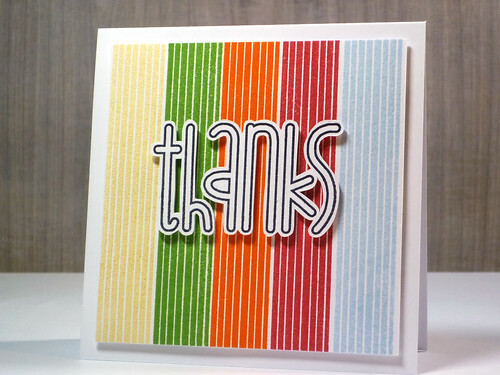 I stamped the stripes in 5 different colors - Gold, Green, Orange, Red and Blue. Then I stamped a sentiment, left it in black and white and adhered it to the card with some foam tape. Here's another card that uses On The Strip 2 again. 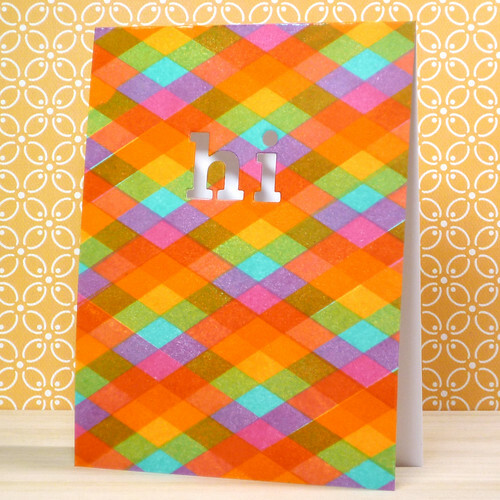 I stamped a simple plaid background and die cut "hi" in the middle. Now let's see your creations with these stripes! Oh my .....the stamping is SUPERB (of course)! I am loving the colors and patterns from the strips! Beautifully done, my little friend! I would LOVE to see your process...maybe next time you can do a tutorial? Pretty please!? Love the first card, but totally in awe of how you made the second. Yes, tutorial, please! These are both amazing. Yes--tutorial, please. Oh these cards are just gorgeous!!!! Would love to know how you make the plaid card though!